How does Prayer Work and How to Pray? In this article we provide an overview of how prayer works and how to pray. There are two types of prayers – for worldly benefit and for spiritual growth. Accordingly, the prayers are answered by a different aspect of God. Spiritual research has shown that even negative energies can answer prayers, to our detriment! One’s spiritual level is the single most important factor in ensuring that one’s prayers are answered. Praying for world peace, while a noble thought, is most likely not to be answered due to the lack of spiritual level of the people praying. Paradoxically, the people who can really effect change through a single prayer are Saints, but They see the futility of praying as They are totally in alignment with God’s will and do not see it as separate from Their own. Lastly, the posture of prayer also contributes to the prayer being answered. When faced with difficult or insurmountable situations in day-to-day life, like the loss of a valuable, an incurable illness, a major financial problem, etc., people pray to God or to an aspect of Him, also known as a deity. These are prayers with material or worldly expectations. Seekers of God, whose main focus in life is spiritual growth, also pray regularly to God not only in difficult situations but even in day-to-day situations. The prayers, however, are not about worldly expectations but about their spiritual growth and are said as a part of their spiritual practice. This article explains the mechanism of how both varieties of prayers are answered. What is the difference between prayer with expectations and without expectations? It is important to note that when there is any problem or difficulty in life, the root cause can be physical, mental or spiritual in nature. Research carried out by SSRF shows that up to 80% of problems in life have their root cause in the spiritual realm. Destiny and departed ancestors are two very important factors in the spiritual causes of problems in life. 2. How are prayers answered? What is the mechanism? 2.1 Who answers our prayers? 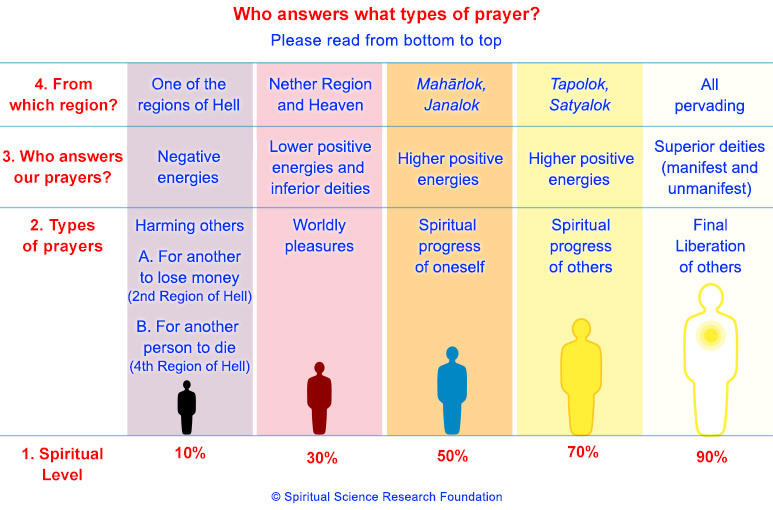 The following diagram shows who answers our prayers depending on the type of prayer. Generally, the prayer differs as per the spiritual level of the person. For example, a person who is at a 30% spiritual level will more often than not pray for worldly things. A person at the 50% spiritual level will more often than not pray for spiritual progress. Accordingly, the prayers are answered by various subtle-energies in the Universe. What is interesting is that even negative energies answer prayers, either where harm is requested and/or to entrap a person under their influence by initially granting their wishes. For example, as shown in the diagram below, a person who prays for the death of another person will be helped by a negative subtle-entity from the 4th Region of Hell (Pātāl). Prayers for worldly benefit are generally responded to by lower deities or lower positive energies. Prayers for spiritual growth are responded to by higher-level deities and higher positive energies. Sometimes higher-level deities also help the worldly situation of a seeker if it is causing an obstacle in their spiritual growth. 2.2 How are prayers answered? When a person prays, he/she remembers God intensely and has an intimate dialogue with Him about issues very close to person’s heart. By the law of reflex action, God also feels closer to him/her. Prayers have the ability to activate the Deity principles (aspects of God) in the Universe. The subtlest frequencies are generated when one pays gratitude along with the prayer. These frequencies have the ability to not only activate but also touch the deity; hence the deity principle is activated faster. This activation of the deity principle (aspect of God) results in fulfilment of prayers. The deities bring about the fulfilment of prayers by the power of resolve. Refer to the article on who is a Deity? Lord, please let me get this job, I really need it. Lord, please accept my gratitude for giving me the thought to pray. Lord, may I do all activities in this entire day as my spiritual practice. Lord, I express gratitude at your Holy Feet for having given me the thought, and for getting this prayer done through me. Prayers attract subtle divine frequencies towards the person and as a result, the Raja-Tama around the person is destroyed. Thus, the environment surrounding the person becomes comparatively more sāttvik. As the subtle basic Sattva component in the surrounding environment is increased, the thoughts of the person are reduced and they also become sattvik. This is because the mind is influenced by the external environment. A sheath (kosh) is the finer, subtler covering of each component of subtle body and is more powerful. Thus the vital body, mental body, causal body (intellect) and the supracausal body (subtle ego) each have a separate sheath around them. Prayer increases the particles of the subtle basic Sattva component in the vital body (prāṇa-dēha) sheath. When we pay gratitude, the particles of the subtle basic Sattva component in the mental body (manodēha) sheath increase. Thus, prayer, complemented with gratitude, results in spiritual purification of the vital body and mental body sheaths. Because of spiritual purification of the vital body sheath and mental body sheaths, the impressions in both the sheaths begin to be destroyed. As the impressions are reduced, thoughts about oneself are minimised and attraction towards worldly things decreases. This leads to an increase in desire for God and a yearning to merge with Him. Also, as both sheaths are purified, negative energies cannot enter the body. Refer to the article on How chanting helps to purify the impressions in our mind. When we pray, we accept our inability to solve a problem ourselves and hence, in seeing ourselves as lesser, our ego is reduced. With a reduction in ego there is a temporary rise in spiritual level. This causes a temporary increase in subtle basic Sattva component. Further, when we pay gratitude, it generates humility in us which has an even greater positive effect on our spiritual level. Hence, our communion with God increases. This rise in the subtle basic Sattva component itself increases our capacity to overcome or bear the problem. 3. When do our prayers work? In our life, 65% of events happen as per destiny. Destined events are those events that we have no control over. Please refer to the article on destiny and wilful action. Destined events, both good and bad, are bound to happen in our lives. Bad destined events may be an illness or a bad marriage. The average person mainly prays to God when bad events happen in their life. They pray to God to relieve the bad event. However, we find that our prayers are not always answered. 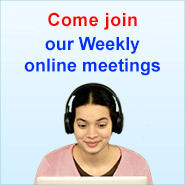 Refer to the article: Destiny as a spiritual root cause of difficulties in life. So what is the law? When does prayer override a bad destined event so that with the prayer, the event itself does not happen or at least we are insulated from it? If the prayer is stronger than the intensity of the destined event, then the prayer will be answered. If the intensity of the destiny is stronger than the prayer, then the prayer will be answered partially or not at all. 4. What decides the effectiveness of one’s prayer? Spiritual level of the person praying – the higher the spiritual level, the more effective is their prayer. Quality of prayer – whether the prayer is mechanical, heartfelt, or with spiritual emotion (bhāv) from the seeker. For whom is one praying (i.e., whether for self or others) – When we pray for others, the spiritual strength required is much more. The greater the number of people in society intended to be affected by the event, the greater is the spiritual strength required to effect the desired result. Only Saints of a higher order can effect change in society. Ego – Lower ego contributes to the effectiveness of prayer. 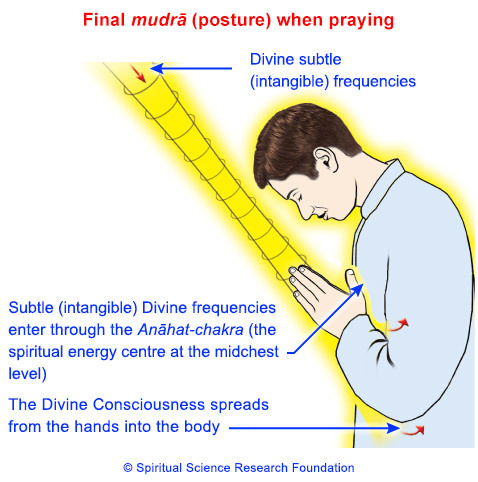 What prayer posture (mudrā) is a person using? This becomes a major factor for the majority of people, as the above factors are lesser in most people. The spiritual level of a person praying is one of the main criteria in deciding the effectiveness of the prayer. For seekers above the 60% spiritual level, prayer is not required. They act from the spiritual emotion/feeling that ‘Let everything happen as per God’s will.’ They actually experience that everything in their lives is happening and is provided for by God’s grace. Their mind is constantly in a state of gratitude to God. Once this state is achieved, prayer is not needed. Prayers of people who are below the 30% spiritual level lack potency and at best they provide them with only psychological benefit. This is because the covering of ego is too great for their prayers to reach the deity principle. Thus, we can see that prayer works most effectively for people between the spiritual level of 30-60%. Refer to the article on ‘Breakdown of world’s population by spiritual level’. From time to time, we hear a call by some people to gather and pray for world peace, or for a noble cause such as reduction in global warming. From the perspective of actual results, this is at best a psychological effort. This is so because major world events have a strong spiritual basis and can only be overcome by spiritual efforts of highly evolved beings such as Saints of a higher order. Even if millions of people (of average spiritual level) get together and make the same prayer for a major world happening, it is akin to many ants trying to lift a boulder. 5. 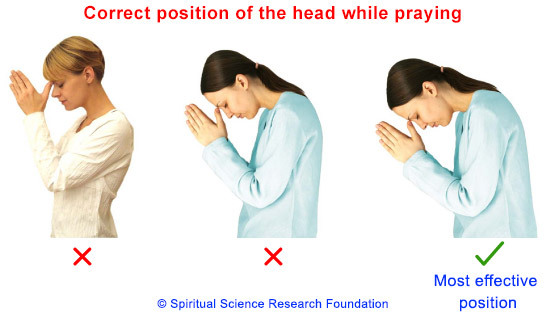 What is the best posture for prayer and how to pray? 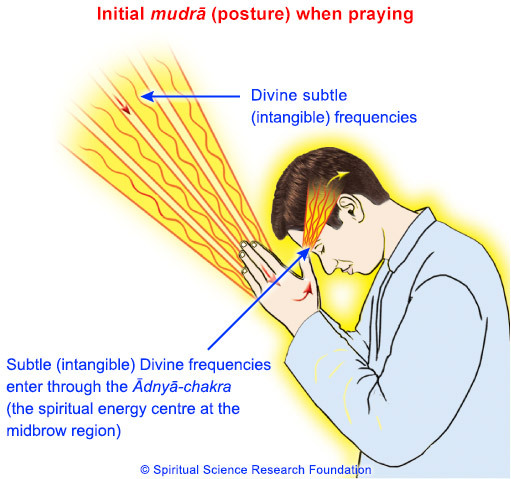 Through spiritual research, SSRF has identified and recommends the following mudra, or posture, that is most conducive to gain the maximum divine energy through prayer. The following drawings based on subtle-knowledge show the two stages in this mudra and what actually happens at a spiritual level when one prays. 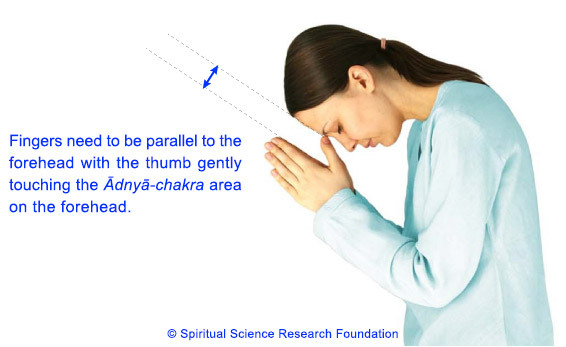 The first stage in this mudra is raising one’s hands in prayer with the thumbs gently touching the mid-brow chakra (Ādnyā-chakra) (the spiritual energy center at the mid-brow region). It is best to begin praying after we are in this position. When we bow our head in this prayer position, it awakens the spiritual emotion of surrender in us. This, in turn, activates the appropriate subtle-frequencies of deities from the Universe. These divine frequencies come in through our fingertips, which act as receptors. These divine frequencies are then channelised into our body through the thumb to the mid-brow chakra. The result is an increase in the positive spiritual energy in us, which makes us feel lighter or gives relief from symptoms of physical or mental distress. After one finishes the prayer, one should assume the second mudra as shown in the drawing based on subtle-knowledge above. This means that instead of bringing one’s hands in prayer down immediately, they are to be placed in the mid-chest region in such a way that the wrists touch the chest. 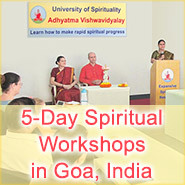 This facilitates the process of more completely absorbing the Divine consciousness (Chaitanya) of the deity principle. So initially, the Divine consciousness of the deity principle that had entered the fingertips now also gets transmitted to the region of chest, the seat of the heart chakra (Anāhat-chakra). Just like the mid-brow chakra, the heart chakra also absorbs sattvik frequencies. By touching the wrists to the chest, the heart chakra is activated and helps in absorbing more sattvik frequencies. When activated, the heart chakra awakens a seeker’s spiritual emotion and devotion. In this stage of the prayer mudra, one should be introspective and contemplate upon the experience of being in God’s presence. Body should be bowed and not erect. Fingers should be parallel to the forehead. Fingers should not be stiff but relaxed. Fingers should be touching each other – not spread apart. Thumb should be lightly touching the area of the mid-brow chakra. Hands need to be gently pressed together with a slight space between the palms. In the case of seekers above the 50% spiritual level, no space is required between the palms. The following drawing based on subtle-knowledge shows what happens when a person at a 50% spiritual level prays with spiritual emotion. The main thing to note is that the people in the vicinity also derive the benefit of the Divine consciousness accessed by that person. (Refer to the part of the drawing based on subtle-knowledge which shows 5% of frequencies of Divine Consciousness transmitted outside the body.) This is why quite often it has been observed that when people pray with spiritual emotion, the spiritual emotion in others in the vicinity also gets activated. 5.4 Does it mean that every time we pray we should take this position? If one is at a higher spiritual level (above 50%), divine subtle (intangible) frequencies begin to be received directly through the Brahmarandhra itself. The Brahmarandhra is a subtle-opening above the crown chakra (Sahasrār-chakra) (as per the spiritual science of Kunḍalinīyoga) that has access to the Universal Mind and Intellect. This subtle-opening is closed in people of a lower spiritual level. The primary factor that helps the opening of the Brahmarandhra is a lower level of ego. When in this phase of our spiritual growth, the need for the prayermudra as explained above becomes less and less. However, if a person between the spiritual levels of 50% and 80% complements his prayer with the recommended mudra, then he gets the benefit of additional Divine consciousness. 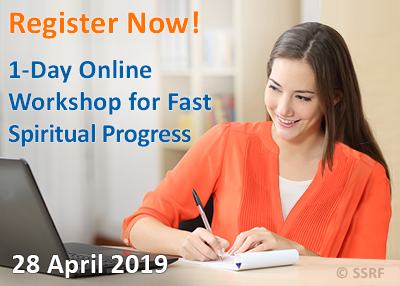 This additional benefit is 30% more in the case of a person at the 50% spiritual level and it proportionately becomes less and less as the spiritual level increases. Since most people are not of a high spiritual level, they are unable to receive Divine frequencies through the Brahmarandhra. Most people (30–60% spiritual level) are, however, able to receive subtle-frequencies through their fingertips (though to a much lesser extent), as our finger tips are very sensitive to receiving or sending out subtle-energy. For people at this level, it is best that they do utilise the prayer mudra suggested above to make a prayer. All other factors remaining equal, by praying using the recommended mudra, a person will add 20% to the effectiveness of their prayer as opposed to not using this mudra. 100% is getting full spiritual benefit, which results in God-realisation. Level of the manifest deity principle, i.e., higher, medium or lower level deity. Percentage of deity principle accessed. This shows the possibility of negative energy interfering with the prayer to reduce a seeker’s faith. The negative energies interfere with the prayer so that the prayer is not answered, thereby undermining the person’s faith. Do try a subtle-experiment by yourself, wherein you say the same prayer using each of the above mudras separately. In some cases, people hold hands and pray. This is also a spiritually incorrect practice because if the person beside us is affected by negative energy, it is more likely that the black energy be transferred to us. The spiritual level of a person generally defines whether a person prays for spiritual growth or for worldly benefit. Depending on the type of prayer, higher-level deities or lower-level deities respectively answer a person’s prayers. The spiritual emotion with which one prays has a positive impact on the effectiveness of one’s prayer. Depending on what type of mudra is used, the benefit that one gets through prayer can vary. All other things being equal, using the recommended mudra (posture) for prayer helps to improve the chances of one’s prayer being answered by 20%. Prayers said by people of lower spiritual level for things that affect the wider population, such as world peace or a reduction in global warming, have no effect. When one pays gratitude along with prayer, it helps to increase the effectiveness of one’s prayer. What is the importance of gratitude? So long as the mind is active, thoughts are bound to appear in it. Thoughts obstruct the dissolution of the mind. Undesirable thoughts also result in misuse of energy of the mind. Praying is useful in preventing this misuse. Praying reduces anxiety and increases contemplation. While performing Spiritual practice, remaining in communion with God is important. Praying to God at short and regular intervals makes it easier to establish communion with God. Due to the prayer, a Deity/ God showers grace and spiritual experiences are its result. This helps in generation of faith in and Spiritual emotion for that Deity. This holy text emphasises the importance of prayer in the reader and motivates the reader to remain in constant communication with God.